I always wanted a beer that represents where I am from. A beer that reminds me of home and great times with friends. I want to make that connection and I want to share my story with you. I had the opportunity to sit down with a good friend Frank from the Minnesota Skinny who is always interested in finding stories like this. Instead of writing another blog post, I think I will just share with you what he has written. As always, he does a great job capturing every little detail. Cheers! Ask Boom Island Brewing Company co-owner Qiuxia Welch about beer back home and she’ll take you to the streets of Chengdu, a city of 14 million in the Sichuan Province of China. She’ll verbally serve you up some of that notorious Sichuan cuisine, known for deep flavors but also for the lip-numbing peppers. She’ll offer your imagination a fresh, light beer; a simple beer, but a rescue craft from the blazing delirium you’ve eaten yourself into. Now, as the Minneapolis-based brewery cruises toward seven years in business, she and her husband – fellow co-owner and head brewer Kevin Welch – launched a beer that brings Qiuxia back to those Chengdu streets. 明 (Ming). It means “Clarity,” but it’s also how you say “Minnesota” in Chinese. The characters on the bottle’s label were drawn for them by a friend back in Chengdu – the original drafts were drawn up on rice paper with a horsehair feather pen and black ink. Qiuxia lived in Chendgu from birth until she moved to the Twin Cities area in 1996 to pursue music studies at Augsburg College. She’s lived in the Cities more or less ever since; but, interestingly, she first met Kevin at a French horn symposium in Beijing (they’re both longtime horn players and have been involved in local orchestras, if you’ve ever wondered about the French horns in Boom Island’s branding). That was the year 2000. By the end of 2001, Kevin and Qiuxia were married. The Welches lived in China from 2005-2006, and it was during this time Kevin says an Asian-inspired beer was first imagined. His home-brewing adventure had begun long before that stay overseas, but his fascination with fermentation and yeast strains connected him with distillers in the rural countryside. He explained his home-brewing interests to locals and exchanged stories. He heard about yeast strains that have been passed down from generation to generation over hundreds of years, and the making of Baijiu. He made beer during his stay, too, something Qiuxia said made them popular in town. Twelve years on, things have gotten a bit more sophisticated. The making of Ming involves the use of sticky rice, in addition to long-grain rice; Pilsner malt; bittering hops, and bitter orange peel; and Tahoma hops, added toward the end of the boiling process. An ale yeast is used, as neutral a yeast as Kevin could find. At 4.2 percent alcohol, Ming is inviting indeed – should you, perhaps, lose count of drinks while you desperately fight the scorch of hot noodles. It’s light and clean, with just enough citrus and bitterness in the finish to let you write “citrus and bitterness in the finish” but not enough to overpower a steamed pork bun or a Shanghai pancake. Qiuxia says half the brewery is represented in this beer’s making and branding, but she doesn’t mean only herself: her parents, “Hu Baba” and “Hu Mama”, traveled from Chengdu to help build the brewhouse while Boom Island was getting started. Ming was welcome in the taproom last Friday with a weekend party that featured Mahjong lessons, a table tennis tournament, and a lion dance. It debuted off-site Tuesday at Tea House in Minneapolis. 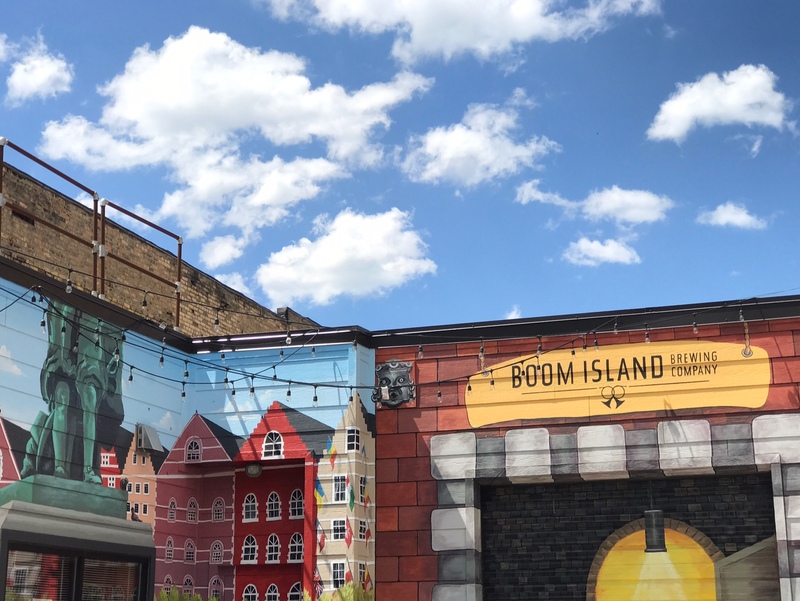 More information can be found on Boom Island Brewing Company’s website or their Facebook page.